LOCATION.--Lat 40°21'56", long 73°58'29" referenced to North American Datum of 1983, Sea Bright Borough, Monmouth County, NJ, Hydrologic Unit 02030104, on right upstream wingwall of bridge on Rumson Road (County Route 520) in Sea Bright, 0.5 mi downstream of Gunning Island, and 3.3 mi south of Sandy Hook Bay. PERIOD OF RECORD.--Unpublished fragmentary gage-height record, August 1997 to December 1999. Continuous-record tide gage, January 2000 to current year. 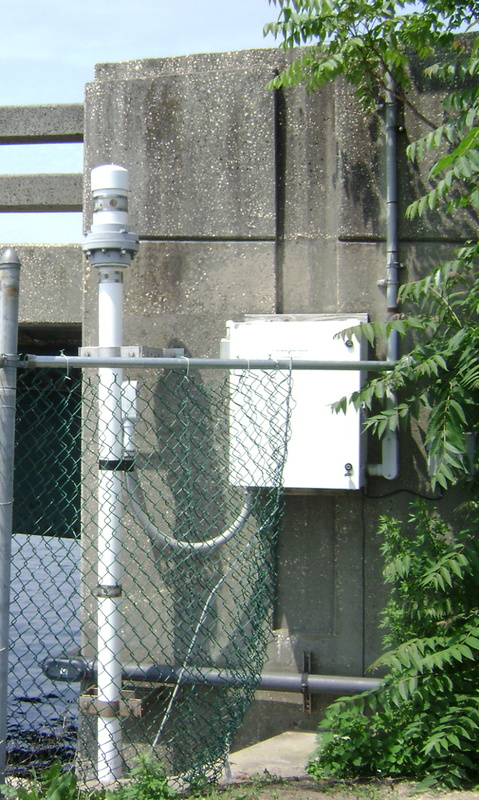 GAGE.--Tide elevation, water temperature, precipitation, air temperature, relative humidity, air pressure, and wind speed and direction recorder with telemetry. Datum of gage is at 0.00 ft NAVD of 1988. To determine approximate elevations to NGVD of 1929 datum, add 1.20 ft.
EXTREMES FOR PERIOD OF RECORD.--Maximum elevation, 9.6 ft, from high-water mark, Oct 29, 2012. EXTREMES OUTSIDE PERIOD OF RECORD.--Maximum elevation known, about 7.3 ft, adjusted to present datum, Dec 11, 1992, from high-water marks along Ocean Drive (State Route 36) in Sea Bright within 1 mi of the gage. High-water mark from the Mar 6, 1962 Nor'easter was at elevation 5.6 ft on Lincoln Avenue in Rumson, about 600 ft south of bridge on Rumson Road.